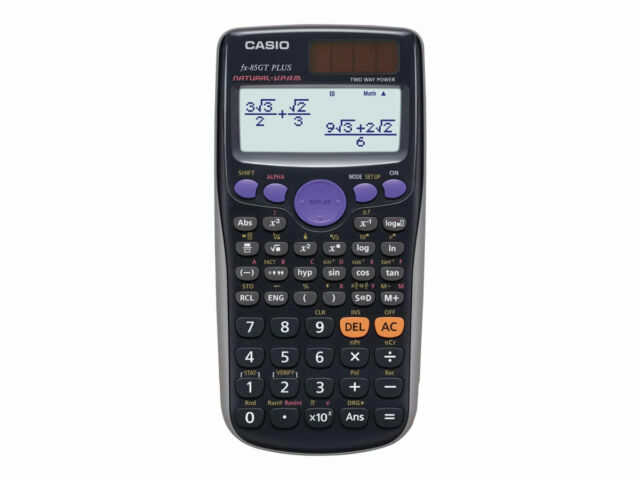 Compact and lightweight, Casio's handheld FX85GT+ scientific calculator offers 260 scientific and mathematical functions. With impressive precision and accuracy, it's ideal (and allowed) for use in British classrooms and GCSE examinations. It features an easily-read, textbook-style display, and its many functions include metric conversions, factorisation, root calculations, and random integer generator. Powered by battery and by solar energy, it's a valuable tool for every student of maths or science. Recommended by most schools - solar panel so the batteries won't run out. I've got a Casio scientific calculator that's over 30 yrs old and still going strong. I think it cost about the same too! This is the one recommended by most schools so the teacher will know how to use it and most of their friends will have the same one. Has all the functions you need and has a hard protective cover. Very fast delivery. Good scientific calculator. Has trigonometry functions, fraction calculations and other complex formulas. Great product with lots of functions.